Test after the time step t + 6 all combinations of the selected parameters ±x%, y%, etc. The combination yielding the highest exergy index is used for the simulation in the considered time step. Exergy describes the maximum work which can be produced from a system under a given environment. This concept is commonly used in process engineering to estimate (or design) various energy systems such as co-generation systems. The exergy concept is useful to assess the thermo-dynamical state of a system, and is extended to the ecosystem analysis, where it is called ecological exergy. The idea of the ecological exergy is depicted in Figure 4. An ecosystem that has temperature T, pressure p, and chemical potential p(1) is assumed to exist under a reference environment that has temperature T, pressure p, and chemical potential p(0) (only chemical potential is different). The exergy gradient can be identified as the work produced, and the gradient is calculated by the difference in chemical potential. 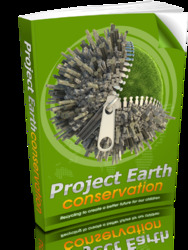 This is the principle of the ecological exergy. Ecological exergy and its application for structural dynamic modeling have been studied in detail by J0rgensen and colleagues. The principle of the application of exergy is that the ecosystem tends to develop with maximizing the exergy to keep the organization far from the thermodynamic equilibrium. According to J0rgensen, the conceptual diagram of the change in the ecological exergy can be depicted as in Figure 5. 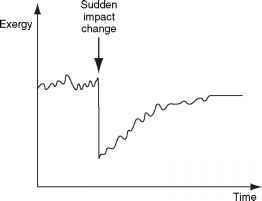 One of the main purposes of the structural dynamic modeling is to predict these organizational trends as a result of some impact, as in Figure 5. Thus, a modeling approach based on exergy (or some other goal functions) is thought to be required. Figure 3 A typical holistic approach of structural dynamic modeling using exergy as goal function. Adapted from Jorgensen SE and Fath BD (2004) Modelling the selective adaptation of Dawin's Finches. Ecological Modelling 176: 409-418, with permission from Elsevier. Figure 4 Idea of the ecological exergy. Adapted from Jorgensen SE, Patten BC, and straskraba M (2000) Ecosystem emerging: 4. growth. Ecological Modelling 126: 249-284, with permission from Elsevier. Figure 5 Conceptual diagram of the trends in the ecological exergy changes. Adapted from J0rgensen SE (1986) Structural dynamic model. Ecological Modelling 31: 1-9, with permission from Elsevier. where Ex is the ecological exergy, R is the gas constant, T is the absolute temperature, ci is the concentration of ith component in the ecosystem, p is the chemical potential, and (pi - pi0) is the difference in chemical potential of ith component between the ecosystem and its corresponding thermodynamic equilibrium under given environment. For a detailed description of the derivation of this equation, the reader is referred to works by Mejer, J0rgensen, and others. 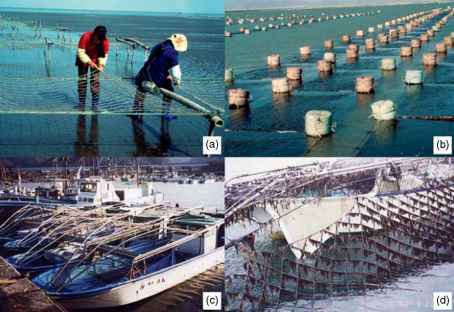 Some applications of exergy for actual structural dynamic modeling, especially for the water ecosystems, can be found in the literature. These outcomes show the reasonability of the utilization of ecological exergy compared with the phenomena observed in the actual ecosystems.